As your membership site matures, its library of resources grows — and even balloons. Tired and proud, you look through your catalog of lessons, ebooks, slide decks, swipe files, worksheets, audio, and video. You think of all the years you’ve kept your head down and done the work. Now, with this big, evergreen content library, you plan to sell even more memberships than you have in the past. That’s what I expected to happen with my membership site. Then, with almost six years of content created, I hit a major downturn I didn’t foresee: for every new member who joined, a renewing member cancelled. New subscribers commented that they didn’t know where to start. Non-renewing members told me they couldn’t find time to make use of their memberships. My big, evergreen content library was transforming from an asset into an intimidating beast that was turning people off. In this post, I’m going to discuss the four ways I tamed my content library beast and turned it into an accessible resource my members are — once again — loving and sticking around for at renewal time. 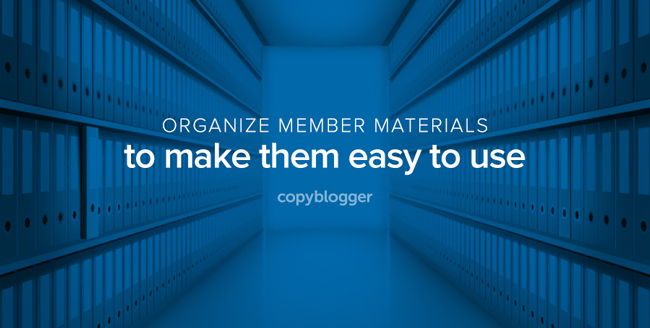 You can use many of these methods for organizing your content even if you’re in the early stages of building your membership site, so let’s get started. It helps the member who knows exactly what resources she wants to track down. It helps the member who wants to explore all of the materials available on your site. First, create an easy-to-understand index for all of the content in your membership site. Don’t stop with this main index. Think like your members. Consider how they might search for materials and give them the guides to find what they need. Medium: audio, video, worksheet, ebook, etc. But don’t create indexes just because you can. Create them because they will be used. My members love and refer back to the ebooks at Get It Scrapped, but they don’t always want to open a full lesson in order to access a supplementary ebook. I provide a graphical index of all ebook covers that link directly to PDF files. It’s easy to add a new book to the spreadsheet, sort the list in alphabetical order, and then copy the spreadsheet column with all the html codes to my membership index page. With more than 300 recordings in my library, and new members champing at the bit to check these out, this index was crucial. To automate these indexes, I place each recording into its own post and add categories for every guest and every topic covered. Members view a list of categories that show, for example, all guest names. They then click on one of those guest names to get a listing of the recordings that match. When membership materials are created over several years, the content structure and delivery will change. New members don’t need to know exactly when you created the content. A mishmash of interfaces is confusing, and it chips away at your members’ confidence in you. Over the years at Get It Scrapped, I used a variety of ways to present my materials. In my recent library overhaul, I set up a consistent and orderly look on every class page — even if they contain different media types. When you’ve got more than 60 classes in your library and every class has multiple pieces, it’s not easy for members to remember if they’ve worked through everything. They might know that they listened to the audio, but did they complete the worksheet or check the supplemental materials? Provide your members with a way to not only check off what they’ve already done, but to keep notes about what they want to do next and how they want to use your materials. A “fillable PDF” checklist lets members digitally check off boxes and enter notes to a form that they save to their own computers. These forms can be created with Adobe Acrobat Pro, Adobe InDesign, or with add-on products that convert a Microsoft Word document to an editable PDF. While these fillable PDF checklists and worksheets are good tools for stand-alone courses, they are not ideal for an ongoing membership since new materials are added regularly, rendering the forms outdated. This is my preferred approach. You can offer checklists that logged-in members can edit, save, and access from their membership accounts. I give my members one complete library checklist on the membership dashboard and shorter checklists on each class page. They can check off lessons, worksheets, and videos completed, as well as enter notes. Even if a membership expires, the member’s progress and comments are still there for use with free materials or a resumed paid membership. The final step in taming the big content library beast is to connect the dots for your members. It’s up to you to tell your members which resources are best for what they want to accomplish. Create a guide for new members — both beginning and advanced students — to familiarize them with the types of content you offer and the mechanics of using the site. Point them to an example or two of your best content. Also, direct them to your newest materials and encourage them to sign up for live and interactive sessions. Make it clear that they don’t need to master basic content before jumping into the newest offerings. Once you create the new member guide, it’s time to create learning tracks. Identify four to six goals your members typically have and create a learning track for each. For each track, clearly define the goal it helps the member accomplish. For each track, create a website page. For each track, start a thread in your community for related discussion, and link to it. For each module within a track, present a link to relevant library content and explain why it’s relevant for the track goal. For each module, include an assignment to get your members creating productively, and invite members to share their work on the community thread for this track. Add an interactive checklist on the track page to make sure members progress toward and achieve their goal. The mature — and loaded — membership library is at its most valuable when your members can easily find what they need and discover new areas to explore. Relevant indexes, a consistent presentation, personal checklists, and learning guides are all tools that tame the beast of a big collection of materials and media. Now it’s time for you to get to work on these four steps. Want to learn more about creating profitable membership sites? The mission of Digital Commerce Academy (DCA) is to provide smarter ways to create and sell digital goods and services, such as membership sites, online courses, ebooks, and more. DCA is currently closed to new members, but you can be the first to find out when it reopens by activating your free membership. In addition, you’ll get valuable “how to” articles and case studies of successful digital entrepreneurs. All you have to do is click here, enter your first name and email address, and you’ll have instant access to your free Digital Commerce Institute membership. Debbie Hodge has developed and sold profitable online classes in the craft niche since 2008. Now, at Teach What You Do, she shows you how to develop a profitable online teaching business. Click here for free community and lessons.